What's the difference between a wild and fancy rat? How many types of rats are there? Can a pet rat survive in the wild? Can a wild rat survive in the home? Whatever it is, how do I catch it? How can I tell the difference between a wild rat and a domesticated (fancy, pet) rat? That's actually a really good question. And it's a determination that, to a person unfamilar with rats (and even to some familar with rats), is particularly challenging. It's challenging because there is no "Rattus Domesticus" species. Unlike comparing a basset hound to a wolf, you won't be able to just look at the basset hound and say "well, he sure does have big ears - guess he's tame!" Rather, you'll have to look a bit more closely. Social Nature: Wild rats are not social by nature. They share what we have to offer and they thrive on our sloppiness, but they do not like us per se as we are a threat (we are predators). 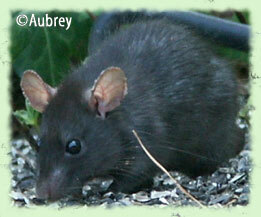 If you approach a wild rat, and he is not incapacitated in any way, he will run from you (bolt), not toward you. 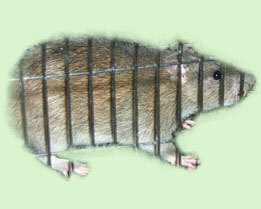 Coloring: In general, a wild rat will be some shade of variegated brown with a lighter brown under-belly. There are different types of wild rats, however, some of which are more of a solid black (and smaller), some of which have a white underbelly (and are also smaller). Fur: A wild rat, if he perceives a threat (which you are), will puff up his fur. You will likely see his guard hairs sticking up from his even coat of fur. Size & Shape: Wild rats are very stream-lined. They must be in order to survive. They may appear "big" because they're puffing their fur, but you won't see rolls. Wild rats can range in size from about 3 inches long and about an inch wide (a baby) to a possible 10 inches long and about 3 inches wide (a teenager). Because their life expectancy in the wild is much less than their potential, it is unlikely that you'll see a rat at his maximum size of about 12 inches. Any larger and the creature you're looking at is not a rat. Ears and Eyes: A wild rat's ears will always be alert. Their ears will appear very rigid and they will move sideways, forward, diagonally, and sideways again at a very rapid pace as they assess the world around them. A wild rat's eyes, assuming he is not incapacitated, will be pried open as far as they can physically go and will appear as near-perfect circles. Posture and Stance: Wild rats, assuming they're physically OK, will always be on the move. You will likely see them standing up on all fours, back partially arched, as if to leap forward. If he is very fearful of the situation, you may also see his tail flapping. He will strike as he feels cornered. Social Nature: Fancy rats are social. A pet rat left in the wild for an extended period of time may learn fear and appear nervous, but if they were handled by their previous owners, they are quite likely to come toward you. 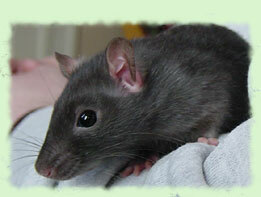 Coloring: Most pet rats are not a variegated brown in color. Pet rats can be found in whites, beiges, peaches, tans, browns, blacks, and greys. The rat pictured above, however, is one exception which is why you can't just base your assessment on coloring. Fur: You will generally not see a pet rat with his fur standing on end. There are, however, exceptions: He may have wavy fur, he may be scared, he may be cold. Size & Shape: Pet rats tend to be pudgy to some degree. You will see rolls and contours. If, however, they've been outside for awhile or if their previous owner "freed" them because they weren't well, it's possible they'd be thin (but with loose excess skin). Pet rats can range from about 3 to 12 inches in length and 1 to 5 or so inches wide. Ears and Eyes: A pet rat's ears, unless he's simply never been handled, will appear very 'soft' (not rigid). 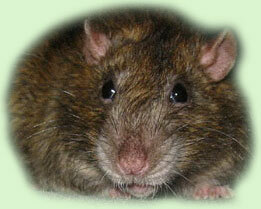 Some rats have rounder ears to the sides of their heads as well. A pet rat's eyelids are generally a bit more relaxed. However, it won't be much of a determining factor if they're nervous. Posture and Stance: It is not common to see a motionless pet rat standing on near-tippy-toes on all fours. He may be nervous, but he will not be nearly as fast as a wild rat and will appear more like a dog sniffing some daisies than a tiger prepping for attack. There are actually many species of rats and they come in all shapes, sizes, and colors. There are brown rats, black rats, small rats, mice, rats with pouches, rats with brushes on their tails, etc. What kind of rat you might find really depends on where you're located. Pet rats are Rattus norvegicus or, the Norway rat. They are the same species and breed as their wild counterpart, but much less fearful, much more friendly, and, of course, come in many colors. Though possible, it's highly unlikely. Pet rats know what they know based on past experiences (like us!). If a rat doesn't know what it's like outside, doesn't know the difference between friend and foe, doesn't know how to protect himself from cold, from illness, from parasites, etc, he can't know how to solve the problems he encounters and therefore is at a greater risk of coming into harm's way. Remember: Rats are animals of prey. Not only are humans dangerous to them in the most obvious sense, but many animals hunt them as well! Yes and no. Putting any wild animal in a confined setting is very stressful to that animal and can shorten his life immensely (not to mention reduce any chance of a good quality of life). A wild rat, in general, isn't going to make a very good pet either. Sometimes litters are found outside and thought to be neglected by their mother and brought inside by an individual with good intensions, nursed by that individual or a wildlife rehabber, and found to be lacking in the instinct department after all is said and done. But it's a very fine line and one that is always under heavy debate. In general, though the intentions may be good, it's best to leave wild animals to wild settings and domesticated animals in the home. See also our sections on Wild Rats and Fostering Young. Whether the rat is domestic or wild really does make a difference so try to find out what you're dealing with before pouncing on the critter! If the rat is wild, the following won't help you (unless he's very young or very sick) so you should, instead, read the Wild Rats page. First, I would very much recommend wearing gloves - thick gardening gloves, thick lined winter gloves, etc. I'm not saying this because rats are any more evil than any other animal or anything, but because scared animals bite! Second, I would recommend finding a box and a sturdy flat piece of carboard. You may be able to just reach down and pick the rat up. To do so, reach under the rat (from the front) rather than attempt to grab the rat from above. Rats are animals of prey and only some take kindly to hawk-like grabbing so it's best to play it safe. The rat may try to run away. You can grab the base of his tail (not the tip) in order to gain a better hold. Grab his body with your other hand as quickly as possible or simply scruff him by grabbing a handful of the skin on his neck. Grabbing a rat's tail either will result in him attempting to take off (without it - which is why it's a bad idea to grab the tip) or will result in him turning around in an attempt to bite the grabber so the grabber will let go (thus, the gloves - rats are very flexible!). By scruffing a rat you reduce his flexibility and he will not be able to easily bite. If he doesn't appear like he'll sit there for you to reach down and grab him, you can use a box to trap him. This will likely work if he's not wild and if there are no holes for him to run to. Drop the box over his head, and with the flat piece of cardboard, slide the cardboard slowly (so as to not pinch any toes) under the box. Once you have the cardboard under the box, hold two opposite ends securely (box and cardboard) and slowly roll the box over. Don't open the box right away as rats can jump! Rather, head over to Basic Care, decide what you're going to do with him, and, in the meantime, place a book on the lid of the box and put the box in a small confined area where you will be able to re-capture him should he find a means of escape.